People are looking for the face-to-face review for aspiring real estate brokers, and the required 120 units of real estate subjects can be earned via a 120-hour Comprehensive Real Estate Seminar and Review or CRESAR. 1. We still haven’t seen any formal announcement from the PRC regarding when the next Real Estate Brokers’ Licensure Exam (after March 27, 2011) will be held. Perhaps the PRC is focusing on the upcoming Real Estate Appraisers’ Exam, as well as the Real Estate Consultants’ Exam. 2. CRESAR review service providers (for aspiring REBs) are probably waiting for the official PRC announcement before they say anything about their CRESAR schedules and pricing. The RESAR Online Review, however, is accepting online reviewees anytime who want to avail of the optional/supplementary review. The earlier you review online, the more confident you will be when you go through the face-to-face real estate brokers’ exam review, because you will be more familiar with the real estate terms and concepts that will be talked about (even if the lecturer’s pace is fast). Hello! I obtained my license from DTI last 2005 and i was not able to renew my license. Until last week when i happen to know that PRC had ended the no exam renewal of license. Please give advise on how i could renew my license without taking the exam…thank you. [From the Admin] Hi! We sent you an email. Thanks! I just called the PRC this morning. The Brokers’ Exam will be on 2012 but the PRC has no calendar schedule yet for 2012. They said, if they have to follow this year’s calendar, it will be again in March 2012 but please this is just their speculation, no definite month for the exam yet. 2012 though is the next Broker’s Exam. This November 2011, the exam will be for the Real Estate Consultants. Hope was able to help. Thanks and God bless. [From the Admin] Thank you for sharing! 🙂 We checked the PRC’s website a few minutes ago, and based on http://www.prc.gov.ph/uploaded/documents/2011ExamSched.pdf it looks like the Real Estate Consultants’ Licensure Exams will be conducted on October 2 and 3, 2011. Thanks! Kailan ang susunod na exam para sa real estate brokers’ license?at kailan ang isked ng review?meron bang face to face review?thanks..
[From the Admin] Hi! We haven’t seen any official announcement from the PRC. 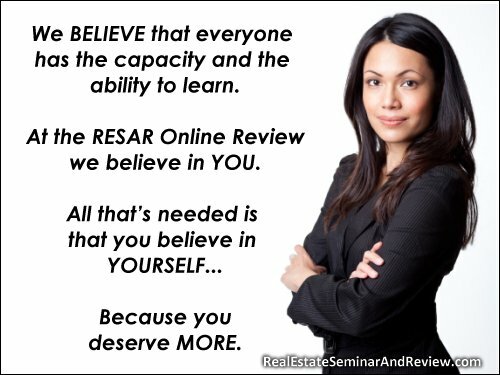 Please join the RESAR Online Review Announcement List so that we can email you any developments regarding the REB Exam or schedules of Comprehensive Real Estate Seminar and Review or CRESAR review service providers (face to face reviews). Thanks! Sir/Madam…..ask ko lang po kung required pa ng 120 units CPE to take the licensure examination for real estate broker…but am a graduate of 4-yr course at nag avail na po ako ng early retirement as a government employee…now as a sales agent po ako ng isang malaking real estate developer d2 po sa aming province…. Please send me a requirements before taking the Real Estate Broker Examination. Thanks po and god bless…..
[From the Admin] Hello! If you’re preparing for the Real Estate Brokers’ Examination, you do not need to earn CPE units. What you need is to earn 120 hours in a Comprehensive Real Estate Seminar and Review, or CRESAR. Pls advise, i only have DTI id last end of dec 2011, any review center coming from imus or nearby in las pinas to hold the review for earning 120 units? asap. [From the Admin] Hi! Do you have a real estate broker’s license issued by the DTI in 2009? Is that why it will expire in December 2011? If that’s the case, you only need 15 CPE credit units to get PRC-registered (without need for examination). [From the Admin] In the past, during the time of the DTI, a Certificate of Attendance of a Comprehensive Real Estate Seminar and Review (CRESAR) was valid for one year. In other words, your CRESAR Certificate can be used when applying for up to two succeeding DTI Real Estate Brokers Exams, because they used to hold two REB Exams each year. Now that the RESA Law has transferred control from the DTI to the PRC, it would be prudent to please get in touch with the PRC to find out the validity period of your Certificate of Attendance of the 120 CRESAR units that you earned from the Urban Institute in March 2011. By the way, we heard that the rumored November 2011 REB Exams have been moved to January 2012. Please keep in mind, however, that we haven’t seen any official announcement from the PRC regarding when the next Real Estate Brokers’ Licensure Exams will be held. I’m planning to to take your online review. Getting ready to send the payment thru LBC. I’m here in Hawaii and inquired with LBC Express, they said that they do deliver to your said address but it is not express. It takes 3 days for them to deliver to you. Also, I’ve noticed your ad about the online offer. Are your courses and subjects are up to date. It noted there that the topics are dated from July of 2009. Before you enroll in the RESAR Online Review, please let us know if your “Associate Degree” is considered a “College Degree” (for example, is it a 4-year course?). hi. the joining fees you have posted, at P1980, how many units can we earn? is that a per session payment? how many hours? pls let me know as i am very much interested to take the next broker’s exam. [From the Admin] Hello! The P1980 is for the RESAR Online Review. It does not earn you any credits. Instead, it is a supplementary review aimed at helping you learn real estate concepts faster, and retain the information longer. For more info about the RESAR Online Review, please join the RESAR Online Review Announcement List. You will need to earn 120 units in real estate subjects before you may secure an Examination Permit from the PRC. Some people earn their 120 units via a 120-hour face-to-face Comprehensive Real Estate Seminar and Review or CRESAR. Please budget around P20,000 for this. confirmed po ba na sa nov 27 2011 ang nxt sched ng real estate broker exam? [From the Admin] Hello! We have been hearing reports of a November 27, 2011 Real Estate Brokers’ Exam, but a quick check of the PRC Year 2011 Calendar of Exams does not show any November 2011 exam for aspiring Real Estate Brokers. November 27, 2011 will be the next examination date for real estate broker exam. Though I have enrolled in the last on line resar review for the March 27, 2011 broker’s exam, but I was not able to take the exam due to late acquisition of my requirements. However, I wish to take the next brokers exam. I had been hearing from some realtors that there will be another brokers exam by November 2011. How true is this? Suppose I enroll again in the resar on line review this early, how much would be the registration fee? I expect it would be much cheaper this early with your promos! [From the Admin] Hi! The joining fee is P1,980 for now. We don’t bring prices lower than previous levels in deference to online reviewees who have joined in the past. We have also been hearing about a November 2011 Real Estate Brokers’ Exam, but we haven’t seen any official announcement yet from the PRC.